Skid Steer Loader Rental – Bobcat T630 is available for rent in Rochester NY, Ithaca NY and Western New York from the Duke Company. 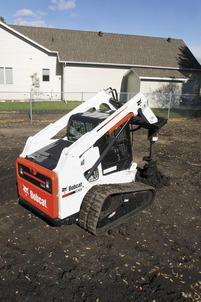 Looking to rent a skid steer for demanding professional contracting jobs? Our rental experts have proudly earned an A+ reputation with professional contractors for product knowledge and exceptional customer service. The Bobcat T630, tracked skid steer, is a very capable machine with substantial power and lifting capabilities.